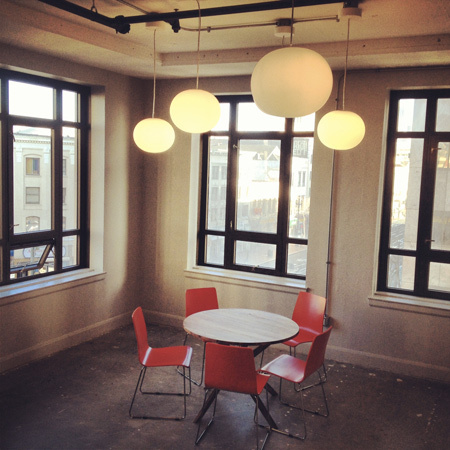 After seven months of working from our homes, Peter and I have moved into Runway SF, a coworking space. Even though it recently opened, it already consists of a number of startups, technology companies, and related businesses. We were lucky and had a connection through a colleague who introduced us to Runway’s office manager. We grabbed two window seats. This space is really cool. First of all, it is in the Twitter building, along with Yammer. Considering that Recognize is partnering with Yammer, the location couldn’t be better. The long hallway, or runway, is filling in with companies. Every day new companies are moving in. We really got in right at the beginning. Runway doesn’t even have a website yet. What is really cool about the igloo is the light show it puts on via remote control. The bar area is usually stocked with beer and liquor. Plus it touts a great ice machine, and sorted compost, recycling, and garbage. Back in the far SW corner overlooks Market St. It has a small kitchen table, arcade console beer keg contraption, and a big refrigerator. All this space needs is a ping pong table! This entry was posted in company on February 8, 2013 by Alex Grande.